Mouth injuries in children and teens are more common than you might think: about one out of three boys and one out of four girls will have experienced an injury before they graduate from high school. Besides contact sports, other types of accidents like car crashes or falls are high on the cause list. Although most dental injuries aren’t considered true emergencies, there are a few where prompt action may mean the difference between ultimately saving or losing a tooth. One such situation is a knocked out tooth. In the event of a knocked out (or avulsed) tooth, your primary goal is to place the tooth back into the empty socket as quickly as possible. Teeth that have been out of the mouth for less than five minutes have the best chance of reattachment and survival. The first step is to quickly locate the missing tooth. Once you’ve found it, use only cold, clean water run or poured over the tooth to carefully clean off dirt or debris (no soaps or cleansers). You should also avoid touching the tooth root or scrubbing any part of it. After cleaning it of debris, gently place the tooth back in its socket, then immediately contact us or visit an emergency room. While you’re en route to our office the patient should carefully hold the tooth in place. If the tooth can’t be immediately placed into the socket (the patient is unconscious, for example), then you should place the tooth in a clean container and keep it moist with cold milk, a sterile saline solution or even the patient’s saliva. Taking these steps increases the chances of a successful re-implantation, although the injury may ultimately affect the tooth’s lifespan. 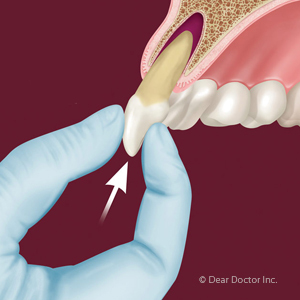 Replanted teeth can suffer from root resorption (where the root tissue dissolves) or a process known as ankylosis in which the tooth fuses directly to the jawbone with no healthy periodontal ligament in between. Either of these conditions can lead to tooth loss. Still, it’s worthwhile to try to save the tooth, even if for a few more years. Those extra years can help you prepare for a future restoration.